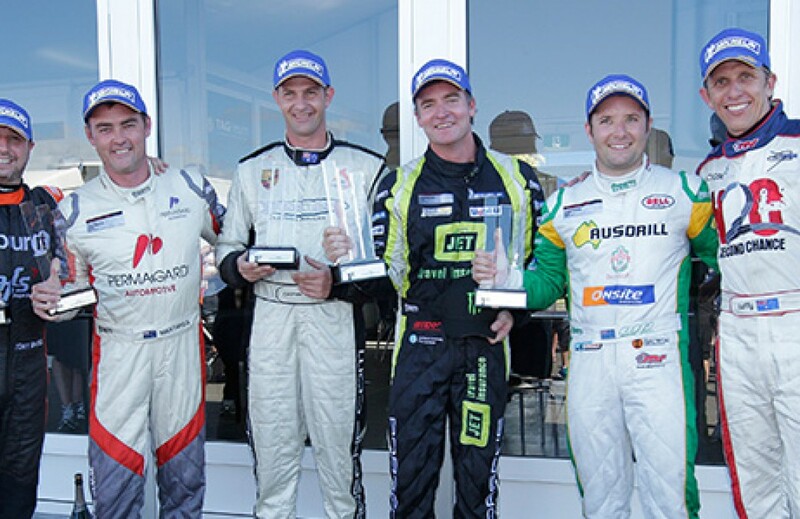 We always look forward to the Townsville Carrera Cup Round, we qualified both cars, Michael Patrizi & Jonny Reid on the front row in 2011 and they both ended up on the podium with MR’s 2009 driver Daniel Gaunt. Last year Alex Davo qualified on pole and was second for the round. We were pleased to continue our outstanding run in Townsville with Luffy & Michael 2nd & 3rd in Pro Class and Batesy 3rd in Elite class, so it was a record for MR to have 3 drivers on the podium. Another second place for Luffy was a great result, but our car is still not quite good enough to beat Baird. More work to do, however Luffys rocket start from position 6 up to 3rd by turn 1 in race 1 was the move of the weekend. See our videos page for in car of Luffys first lap from race 3. Like Luffy, ‘Stiggy’ wasn’t completely happy with the balance of his car over the weekend. The team made quite a few improvements but we always seemed to be one session behind the track conditions and by the time we had his car how he wanted it for race 3, everyone was on worn tyres and it’s very hard to pass good drivers when you’re all struggling for tyre grip. Still happy enough with 3rd for the weekend. Batesy was looking forward to Townsville as it’s a circuit he did well at in his V8 Supercar DVS days. And he was extra motived after missing out on this round last year while recovering from neck surgery. He did a great job over the weekend keeping out of trouble, in his usual forceful style, with netted him his first podium for the season. As Tony’s rookie year, this was another new circuit for Wallsy and one that can’t be tested at prior, so he came into the Townsville round with the clear ‘Objective’ of learning the track as quickly as possible. Tony was hit from behind at the start of race 3 so had to pit for a new LR. The mission of learning the track was accomplished although he will never be satisfied until he is winning races in the Elite category. This was a standout weekend for Renee, despite her first DNF in Carrera Cup. In race 1 a bizarre occurrence lead to her main power switch cutting power to all electrics. Despite the setback, Renee drove with new levels of aggression and commitment to record personal best results in Pro class with 8th in race 2 and 7th in race 3. This was the first time MR had 3 drivers on the podium so it was especially pleasing and a great reward to the awesome bunch of boys and girls behind the scenes at MR.